North BOABO, as viewed to the south. The Algonquin Bridge is visible, crossing over the riverfront. 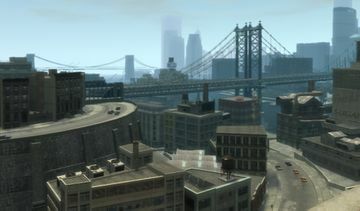 BOABO is a neighborhood in western Broker, Liberty City, in Grand Theft Auto IV. The neighborhood's name is an acronym for "Beneath the Offramp of the Algonquin Bridge Overpass." It is bordered to the northeast by Stone Street and Valley Forge Avenue (Cerveza Heights); to the north by Hoover Street (East Island City); to the west by the Humboldt River; to the south by Chicory Street (East Hook); and to the south and southeast by Brunner Street (Rotterdam Hill and Downtown). The neighborhoods and areas of western Broker (i.e. BOABO, East Hook, and Hove Beach west from Iroquois Avenue) lie at sea level along the eastern bank of the Humboldt River - which happens to be at the foot of a rise in the topography of the land east of the riverbank. For this reason, these areas are physically separated from the rest of the borough. As such, western Broker neighborhoods have developed similar aesthetic values and characteristics with each other that are, at the same time, completely distinct from other neighborhoods in Broker. Each area primarily consists of warehouses, docking facilities, and other such industrial structures. BOABO is experiencing major gentrification, with many of its abandoned industrial facilities having been converted to lofts and condos. However, several warehouses and docks remain, particularly around the southern part of the neighborhood. The effect of gentrification can also be seen in neighboring East Hook, although to a far lesser extent due to its proximity to a working port. The Angels of Death makes BOABO one of their territories. The Liberty City Subway does not have a station in BOABO. The nearest stop is Huntington Street, in neighboring Cerveza Heights. 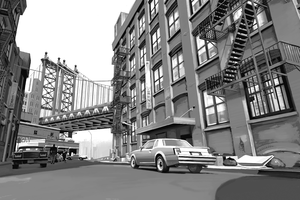 Game art of a BOABO street (between Mohanet Avenue and Chicory Steet) featured in GTA IV's loading screen. Its picturesque view of the Algonquin Bridge intentionally invokes a similar view of the Manhattan Bridge from DUMBO's Washington Street. Brucie Kibbutz, a friend of Roman Bellic's and was once called "the steroid junkie" by Niko Bellic for overexercising. Brucie lives in a very poor neighborhood with homeless people standing around his house. Brucie's house itself is a very expensive one, though. Strangely there is no front door to Brucie's home, making the player wonder how Niko Bellic enters the house. In the in-game television show I'm Rich, the sugar factory (Twitchins Sugar) to the left of the picture is shown to be purchased by Tony McTony. There are also storage boxes for a fish company that reside just down the street lying around. Betta Pharmaceuticals is located next to Brucie's home. The Clocktower building complex, most notable for its rooftop CLOCKTOWER sign and digital clock. The Auto Merchant in GTA Chinatown Wars, located just south of the Algonquin Bridge's Broker end. The Clocktower, based on the Watchtower in Brooklyn. The Twitchin's Sugar plant, based on the Domino Foods plant in Williamsburg, Brooklyn. This neighborhood is inspired by Brooklyn's DUMBO neighborhood. The name is a direct reference to the meaning behind DUMBO's name (which stands for Down Under the Manhattan Bridge Overpass). DUMBO and BOABO are both gentrifying industrial neighborhoods located along the west bank of a river. This page was last modified on 27 April 2012, at 13:26.